The web based installer version can not be used since the install will attempt to download files from a no longer existent server and the installation will fail in a few seconds. If installing the English version in a country different than the United States see the precautionary ‘Special Instructions:’ Note(in red) below. Install .NET 2.0 by enabling .NET 3.5 in Windows 10 Program and Features/’Turn Widows features on or off ‘ then Check the box adjacent to .NET Framework 3.5(includes .NET 2.0 and 3.0). Click OK. Close Programs and Features. This step is mandatory — .NET 2.0 must be installed prior to running the installer program executable. Click ‘Install. Do not interrupt the installation. Once the installation is complete, the program will/may run and prompt to setup an email account. Set up your email account or cancel and setup later. When setting up an email account it would be prudent to do it manually by choosing the ‘Manually configure server settings’ option. Important - if setting up an Outlook.com type email account(Outlook/Live/Hotmail/MSn.com) ensure setup is done manually and only choose the IMAP or POP protocol. Do not choose/use the ‘Windows Live Hotmail’ option since that choice will attempt to use the Http(DeltaSync) protocol which is no longer supported by the backend Office 365 Platform server. Navigate in Windows 10 to Settings/Time and Language/Region and change to U.S.
Summary: Microsoft officially removed the ability to download the Windows Essentials 2012 Full Version installer file from their servers. The removal of the installer file has been expected since Microsoft ended all support for Windows Essentials 2012 in January 10, 2017. Windows Live Essentials 2011 and 2009 installer files were removed and ceased support quite some time ago. The Windows Essential 2012 installer file may be available from other avenues(friends, third party sources) though caution is warranted from obtaining installation files from outside sources. It would be prudent, if still using a Windows Essentials 2012 products(Mail, PhotoGallery/Movie Maker, Writer) to consider investigating and/or switching to an alternative program for your computing needs and experience. It would also be a good idea to consider archiving any important data to an external source outside of Windows Essential application programs(e.g. email messages and Contacts exported/backed-up to an external thumb or hard drive). Note: This Blog entry is now obsolete – Windows Essentials 2012 installer files are no longer available from Microsoft. Ever since Windows 8.0 was released the possibility of the Windows Essentials 2012 suite of products no longer being available and/or not supported has been a valid concern. Windows Live Essentials 2011 and 2009 Full and unified web version installers are no longer available from Microsoft web site and servers. Windows Live Essentials 2011 and 2009 are no longer supported products. If using one of more of the Widows Essentials 2012 suite of products, it is highly recommended to download the Full version installer for archive purposes in the event a reinstallation is necessary, clean installation on a new or different pc, and/or backup requirements. It is safe to assume that Windows Essentials 2012 will not be supported in the future. End of support does not always mean, no longer capable of being used but it does usually mean end of availability to obtain its installer files. Note: The Direct download link above is for the English language installer. For a different country specific version please replace the ‘en’ in the above link with the local language code. (Note: Email notice shown below in the ‘Additional Information’ section). If using Windows 7, upgrade to a newer version of Windows(Windows 10) and use the included Mail App. The deprecation of the DeltaSync protocol is due to the migration of all Outlook.com type accounts to the new backend server on the Office 365 platform which does not support DeltaSync. 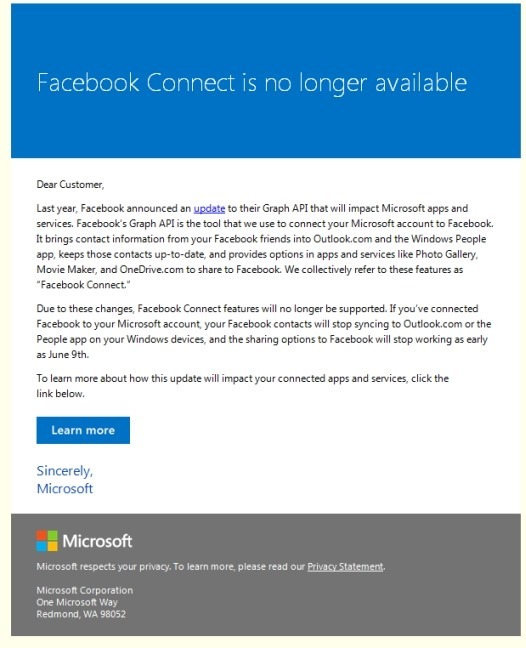 Contacts and Calendar data will no longer synchronize between account web based cloud services(People.live.com and Calendar.live.com) and Windows Live Mail. Any changes to Contacts or Calendar data will have to be made in both locations. Use of the IMAP protocol will continue to mirror the messages and folders and subfolders between WLM and the accounts web user interface INBOX. Back up your Contacts to a CSV file or VCF files, Stop signing in to discontinue using the previously synchronized[Online-Local] database, and Import your Contacts from your backup into the Default[Local only] Contact database. Earlier this year we introduced a new Outlook.com that will help you collaborate with others, focus on what matters, and get more done. The new Outlook.com delivers an exciting set of new experiences across web, phone, and desktop, and we’re eager for you to start using it. It appears that you are currently using Windows Live Mail 2012 to connect to your Outlook.com account. 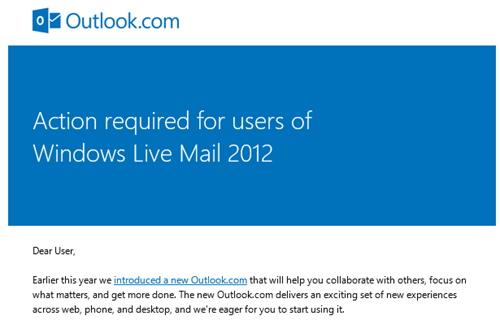 Windows Live Mail 2012 does not support the synchronization technologies used by the new Outlook.com. When account upgrades begin at the end of June, you will no longer be able to receive email sent to your Outlook.com account in Windows Live Mail 2012. Rest assured, you can always access your email by logging into Outlook.com from any web browser, and you will continue to have access to all your data that is currently in Windows Live Mail 2012. If you currently use Windows Live Mail 2012, we recommend that you switch to the Mail app in Windows today. The Mail app is built in to Windows 8/8.1 and Windows 10, and has a more modern design. To begin using it, simply launch the app and add your Outlook.com account. If you are using Windows 7, you can upgrade to a newer version of Windows to enjoy the Mail app and the other benefits. If you do not wish to upgrade, you can access your account via a web browser, or, you can take advantage of a free one-year subscription of Office 365 Personal, and use Outlook 2016 to connect to your account. * This Office 365 subscription also includes other productivity applications such as Word, PowerPoint and Excel. It works on Windows 7, Windows 8/8.1, and Windows 10. Please take action before June 30th, 2016, which is when we’ll begin upgrading accounts that currently use Windows Live Mail 2012. If you have more questions, please find answers to common FAQs in this help article, or you can contact Microsoft support. We recognize that changes like this can be difficult, and apologize for any inconvenience this causes you. We hope that you’ll enjoy the benefits of moving to the new Outlook.com. DeltaSync provided synchronization of email messages and folders/sub-folders between the Outlook.com type accounts configured in Windows Live Mail and the corresponding account’s web based Inbox. POP3, does not support synchronization of messages, folders, subfolders between the local email client and the account’s web based INBOX. (NOTE: To use POP3 in a local client, the POP3 setting must be enabled in the account’s web based user interface(UI) Settings). April 17, 2016: Added comment and link for requirement to enable POP3 in the account’s web interface Settings. Once an account is migrated any changes to Contact and Calendar data will need to made in both locations(web UI People service) and the local email client Contacts module). The lack of synchronization also indicates a need, if using either location(web UI or local client), to maintain backups of Contact data(exported to CSV or VCF or PST files) for recommended archival purposes. Microsoft’s currently supported local email clients for the Office 365 backend server are Outlook 2013, Outlook 2016, Office 365(which includes Office 2016), Windows 8.1 Mail app and the Windows 10 Mail app. Account migration is expected to be completed by the end of 2016 CY First Quarter of 2017 CY. June 30, 2016: Revised content for better clarity, added new content, re-organized bullet items. The Facebook article provides details on the Graph API 2.0 change and additional links on the API Versioning and support period for previous Graph API versions. Note: This article is obsolete – Microsoft has removed all software for Windows Essentials and Windows Live Essentials applications from their servers. Downloading the Full or Web Version installer is no longer possible from Microsoft. The links shown below will no longer function. Main article left intact solely for archival purposes. Note: Direct download links above are for the English language installer. For a different country replace the ‘en’ with the local language code. 5. Photo Gallery and Movie Maker in Windows Essentials 2012 install as one combined, single package. 6. Windows Update KB 2741355 is a pre-requisite for DirectX 9 support in Movie Maker on Windows 7 or Windows Server 2008 R2 systems. 8. Live Mesh (included in 2011 version) was discontinued and no longer available. Live Mesh replacement is OneDrive (fka SkyDrive). Windows Live Mail stores and exports Email and News messages on a pc in a viewable text file format.